Piece together the perfect sectional for your living space with this modular sectional. 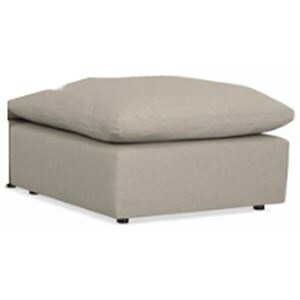 Corner, armless, and ottoman sections allow you to move pieces around to fit any constraints a room might have. Loose pillows and seat cushions offer plenty of plush comfort to help you relax at the end of the day. Add a casual look to your home with this sectional. The Envelop Casual L-shaped Sectional with Ottoman Chaise by Bassett at VanDrie Home Furnishings in the Cadillac, Traverse City, Big Rapids, Houghton Lake and Northern Michigan area. Product availability may vary. Contact us for the most current availability on this product. 2631-30FC Corner Chair 1 40" 40" 39"
2631-00FC Ottoman 1 40" 40" 21"
2631-20FC Armless Chair 1 40" 40" 39"
Browse other items in the Envelop collection from VanDrie Home Furnishings in the Cadillac, Traverse City, Big Rapids, Houghton Lake and Northern Michigan area.